If you own a car or truck that has a clutch and need clutch repair or replacement, let our ASE certified mechanics take care of that for you. Manual transmissions typically can be more reliable than an automatic transmission. They can often last for 100,000 miles or more. But one weak area with manual transmissions is the clutch. We can’t really blame the clutch, however, for being a weak link. After all, it takes a lot of wear and tear. Every single time you shift, the clutch has to be disengaged and then re-engaged. If you drive in an area where there is a lot of traffic, you are especially putting a lot of stress on the clutch, putting it through hundreds of cycles of engaging and disengaging over and over again, just in that one driving session. The wear adds up day after day, month after month, year after year. Eventually the clutch will start to slip, make noise, and then wear out. You can prolong the inevitable, however, by having The Transmission Shop provide manual transmission service and replace the gear oil. This will allow you to add some extra time onto the life of your clutch and avoid it from wearing out prematurely. But when the unavoidable finally does happen, and your clutch reaches its end, The Transmission Shop will replace the clutch, pressure plate, and throw out bearing. We will also will resurface the flywheel. View The Transmission Shop as your source for all types of transmission repair and transmission service, including the replacement of your clutch. How do you know when it is time to replace the clutch? LOOK- Check your vehicle’s tachometer when you are driving, and notice how it responds when you shift. A clutch that is beginning to slip or wear out will not shift as smoothly, and the indicator on the tachometer will move erratically up and down. FEEL- Does it feel rough when you shift into a different gear? If you notice that your engine reacts by jerking abnormally when you up shift or down shift, then this may indicate that your clutch is headed toward that big white light in transmission heaven. LISTEN- When you engage the stick shift, notice how the engine reacts. Is it revving excessively or irregularly? Oftentimes, this symptom is combined with the tachometer needle bouncing up and down erratically and the jerking motion of the car. All of these are warning signs of a sick clutch. SMELL- When a clutch is dying, it often omits a very unpleasant smell similar to rubber burning. The smell may appear to emanate from the passenger compartment of the car. But if you park the vehicle and exit it, you may well also smell it from outside of the car. The source of the pungent smell is friction from the worn clutch contacting the flywheel in an improper manner. 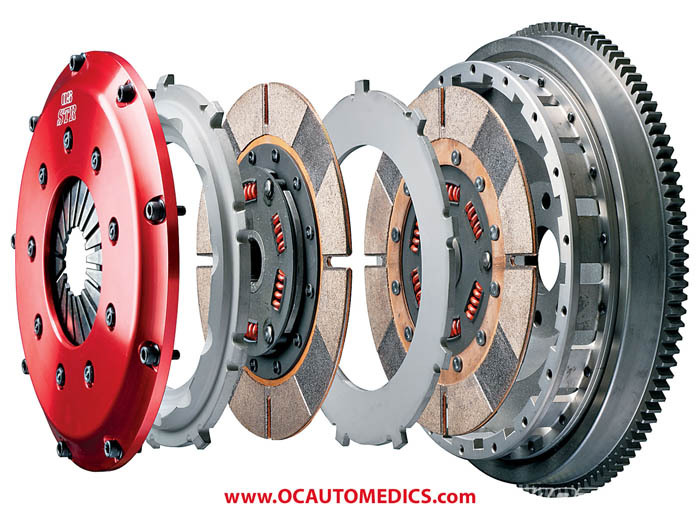 You do not have to have ALL of the above symptoms in order to indicate that you need clutch repair or clutch replacement. If you even experience just ONE of these warning signs, it would be a good idea to bring your vehicle to OC Automedics Shop in Rancho Santa MArgarita, so that we can thoroughly inspect the source of the problem and properly diagnose it. Only trust your car to the experts!